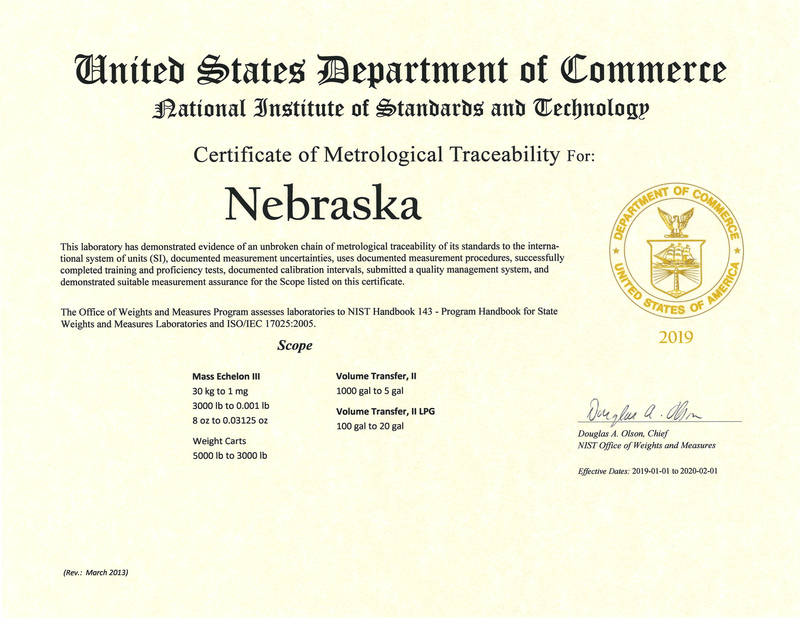 The Nebraska Standards Laboratory (NSL) maintains traceability of Nebraska’s primary standards of measurement to the International System (SI) of units through the National Standards, located at the National Institute of Standards and Technology (NIST), Gaithersburg, MD. Certifications of secondary standards issued by the NSL provide traceability to the SI through an unbroken chain of comparisons. The NSL verifies secondary (field) standards used for the enforcement of the Nebraska Weights and Measures Act. The Standards Laboratory also provides calibration services to weights and measures sales and repair personnel and private industries. At least every 12 months, all field standards that are used for servicing, installing, repairing, reconditioning and testing weights and measures devices for which the competence of a sales and repair personnel or employee sales and repair personnel is registered shall be submitted to the Director. Prior to initial and subsequent use, the standards are required to be verified as correct, calibrated, or both, by the Director. The NSL schedules standards calibrations by appointment only. All standards that are brought to the NSL without an appointment will be refused. Request for calibrations of standards will be scheduled on a first come first serve basis and as time permits. If standards are to be shipped to the NSL, make sure they arrive prior to your scheduled appointment. Call the Nebraska Standards Laboratory at (402) 471-2087 to schedule an appointment. All standards submitted for calibration must meet the requirements set forth in NESOP-5 before being accepted by the Metrologist. (Laboratory Customer and Food Safety and Consumer Protection – Weights & Measures Field Standards / Equipment Pre-Calibration Procedure). Click on the pdf to download or view the requirements. Two forms are required before standards are accepted for calibration: the Artifact Intake / Work Order form and the NE-Biohazard form. Both forms must be completed by the customer and must be presented to the State Metrologist upon arrival for the assigned scheduled appointment. Click the pdf to download both forms or call the Nebraska Standards Laboratory at (402) 471-2087. Click the pdf to view and download the Nebraska Standards Laboratory Operating Procedures and Fee schedule and operating procedures as set in regulation. The list of pdf files below contain the calibration certificates issued to Nebraska Department of Agriculture, Weights and Measures Inspectors used in the testing and certification of commercial weighing and measuring devices. If you need a copy of the standards calibration certificate for ISO audit requirements, look at the bottom of the Weights and Measures device test report, identify the inspector area number, click on the pdf file with the corresponding inspector area number and print the required certificate for that inspectors standards.